A dull knife is dangerous to use and frustrating at best for any serious sportsman, leading to ruined materials, cut fingers, and overused muscles. So why do so many blades go unsharpened? Some may be tempted to say that sharpening a blade is complex for even professionals, but with a little practice and the right materials, amateurs can be well on the way to maintaining the fine edge every blade should have. With several options, it’s easy to choose which one works best for your blade and your lifestyle to ensure you can keep slicing for years to come. Read Our Guide on the Best Knife Sharpeners on the Market Today! Sharpening a knife involves three main stages, each of which offers a different level of renewed sharpness. Sharpening itself is most effective for renewing the angle and sharpness of a cut, and is done by removing a thin layer of metal to reveal a more consistent and thinner edge. This can be done in several different ways but generally requires the use of some kind of grinding material. The second stage, straightening, aims to realign the existing metal and removes only a small amount of the top layer of metal. The final stage, polishing, returns a bright finish and is the finest level of sharpening. It does not necessarily alter the blade significantly but helps improve visual appearance and the extreme fineness of the edge. It’s best to do routine maintenance with straightening and polishing and only sharpen as needed, usually once or twice a year, to extend the life of your blade. For each stage, different materials are needed, and depending on the composition of your blade, the type of material best suited for it will vary. The primary methods for sharpening are via automatic sharpeners, with sharpening stones, and with ‘makeshift’ implements, but due to their prevalence, many opt for automatic methods. When sharpening knives, always exercise caution and start slow until you know exactly what you’re doing. A knife in motion is a hazard, especially for amateur sharpeners. Automatic sharpeners typically are two stage and have one v-shaped opening with coarser materials for sharpening, and another with fine ceramic for straightening. When purchasing, it’s important to look at what metals the sharpener will work best on. Too coarse of a stone wears away the blade much too quickly, but not coarse enough fails to reshape and adequately sharpen the edge. The best way to use an automatic sharpener is to pull the knife through the coarse notch with gentle pressure to only smooth away the very top layer. Depending on the condition of the blade, this may have to be repeated several times but should be done until the blade slides smoothly through the notch. 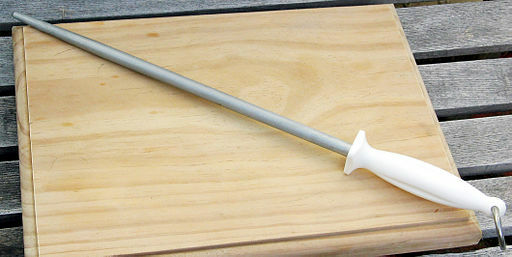 The edge can be tested by running the blade horizontally over a smooth but somewhat soft surface, such as a polished wood or plastic cutting board. If it slides over without catching, the edge may not be sharp enough. Once the edge is sufficiently sharp, however, the edge can be honed and finished by running it gently through the ceramic section several times. A perfect edge should be so small it is difficult to see, so a visual check can help confirm the readiness of your blade. It’s worthwhile to consider investing in a ‘steel’, a rod for straightening the blade. Steels help reduce wear by maintaining the edge over time. The rod should be held straight up and down firmly against a solid surface, and the angle to hold the knife at can be determined visually. Most knives should be straightened at 22 degrees, so an easy trick is to hold the blade first perpendicular, then cut that angle in half and then in half again so a 22.5 degree angle is achieved. Get a feel for the angle and make sure you know what it visually looks like before making your first pass down the steel. Starting with the the handle against the steel, pull downwards and towards yourself with constant moderate pressure. There’s no need to speed along, but as you get used to the process you’re sure to get faster. Depending on what you prefer, you can either do one side at a time or alternate between edge. Developing a rhythm helps maintain a constant angle and improve your form. The best cure is not ailing to begin with, so make an effort to straighten your blade any time it feels duller. Keep in mind that great care should always be taken when manually sharpening or straightening a blade. Manual methods of sharpening require several tools but result in extremely sharp edges and a sense of childlike glee as it allows you to harken back to your scouting days. Absolute necessities include whetstones, metal cleaner/oil, and a soft cloth. Whetstones vary between coarse and fine and can be extremely costly, but the most common type has a coarse and fine side and is relatively inexpensive. 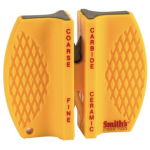 As with the automatic sharpener, it’s important to know if the coarseness of your whetstone will work well for your blade. Before even starting sharpening, it’s vital that the blade you’ll be using is cleaned well and oiled gently to ensure it doesn’t drive any dirt or grime into your whetstone. After wiping off the blade entirely, you can use the same trick as above to reach a 20 degree angle- so start perpendicular, then cut the angle in half two times. For manual sharpening, it’s also important to raise the up and down angle of your blade by about 20 degrees, but this can be done visually as long as you keep the same angle throughout the entire process. Once you’ve found the right angles, get a feel for them before placing your non dominant hand on the top side of the blade to gently increase pressure, being careful to stay away from the edge. Pull the knife across the stone towards you while maintaining a constant pressure until it feels smooth all the way across- usually around 5 strokes for a well-maintained blade, and 20 or more for a dull one. The same process should be repeated on the other edge until it draws across the stone with ease. Sometimes, a curl along the length of the blade is formed. This curl, called a burr or wire, is not visually obvious and can only be felt but is actually too delicate for use and needs to be removed with finer stones. If you do wish for a razor sharp edge, over sharpening with gradually smaller and smaller grit stones can produce a perfect razor edge, but basic sharpening usually only requires two grits. The knife should be further sharpened by flipping the stone over and repeating the process with the same angles as before. 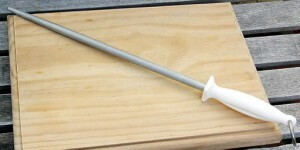 The edge can then be finished by straightening with a steel as described above. As an optional step you can also polish your blade but for a pocket knife or hunting knife this will not make a significant difference. You may know of stropping from its iconic use in classic barber shops, and that’s no coincidence. Stropping produces an edge so fine it is considered to achieve the closest shave possible. This is done by running a blade along leather that has been rubbed with abrasives. 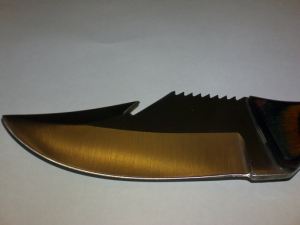 A knife should always be washed before stropping to protect the leather from having metal or stone embedded in it and reducing its effectiveness. Stropping paste is preferable as an abrasive, but some use green chromium oxide, although I would not recommend doing so. The strop can be prepared by gently rubbing a small amount of stropping paste into the leather, as most pastes should be safe to the touch. Once everything is prepared, stropping is relatively simple. With the edge pointed towards you, pull the blade along the strop away from you in a smooth continuous motion. Keep the spine, the non-sharp edge, pressed against the leather to prevent the sharp edge from cutting into it. The pressure is tricky to gauge at first but with enough practice it feels like second nature. It may also be difficult to get a feel for the best speed, but this varies based on the pressure a person prefers to use so see what works best for you. After a few strokes you should have a razor sharp edge ready for shaving or showing off. In survival situations or in the wilderness, a decent alternative to stropping leather is cardboard but an abrasive must still be used or it will not polish your blade. It is a dangerous and foolish idea to think that stropping will work on jeans or other clothing still on your body, since the angle is not conducive to the pressure needed to polish the blade without undoing the straightening done earlier. Other makeshift sharpening methods are only semi effective, but will work in a pinch. A ceramic coffee mug can be used as if it were a whetting stone, but using one will take many more strokes and is more dangerous considering that it is much more delicate and moves more easily. The cup should be placed opening down on a flat, rough surface to try to keep it still as best as possible. Ceramics are generally better at straightening than sharpening, so this method will not be as effective for dull blades. 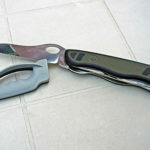 Scissors can be used in emergencies almost like an automatic sharpener by running the blade through the v of the open scissor blades, but considering that there are now three large sharp edges involved in this method, I would not recommend it. Coarse found materials such as sandstone or slate can be used with caution in extreme cases, and in the case of an unknown whetting stone it’s better to wet it and only do a few strokes at a time, pausing to ensure it is not causing burrs or nicks to form on the edge. Quartz is only acceptable as a very last ditch measure for sharpening. Considering what a good sports knife can cost, it may be worth it to just wait to get back to a reliable sharpener. So be sure and check out our best knife sharpener post to find the sharpener that meets your needs. Sharpening your own knives can be tricky and a little scary at first, but saves money in the long term by avoiding professional sharpeners and having to replace an otherwise perfectly good knife. Well made sports knives are designed to last for dozens of years and can become a keepsake for younger generations with proper care, so why not grant your old knives new life? Happy sharpening!